I am still reeling from the impact of #SOD13, the first Spaghetti Open Data gathering. What they wrote about it, though a little overenthusiastic, is largely true. #SOD13 was a major energy high; it let us glimpse another possible world, and I am proud to have contributed to making it happen. In my perception, a fundamental driver of #SOD13’s success was its uncompromisingly inclusive stance. Spaghetti Open Data was inclusive from day one, because we designed it that way. At the time (2010) I was thinking of a mutually respectful encounter between experts from different domains, hackers and civil servants, computer scientists and policy makers. #SOD13 aimed higher than that, all the way to the inclusion, as a protagonist, of anyone wishing to be part of the community. The problem was how to achieve this without watering down the gathering, without giving up on the opportunity to push to the edge the technical expertise of the more skilled members of the community. We wanted to boost inclusivity not by forcing everyone not to hack (which we could have done by, say, focusing on discussing the prime principles of open data), but by presenting participants with a sort of menu of things to do. Different items on the menu required different skills: programming, understanding and writing legal code, statistical data analysis, but also citizen engagement, data cleanup, monitoring. Each participants decided what she wants to do on the basis of inclinations and skills, and all these activities are part of a workflow to build technically complex projects. In this way, everyone involved, whatever his or her skill level, can jump in and be a civic hacker, immediately and in the narrow sense of the word. All it takes is being willing to get your hands dirty. #SOD13 designed and deployed four of these activities. The non-technical hackathon. Led by two young lawyers passionate about open data, Morena and Francesco, one of the hackathon tracks revised the European Commission’s EPSI Scorecard for the part concerning Italy. A while earlier, we had noticed that these data were in urgent need of an update. The revision required half a day of work, a lot of web searching for supporting evidence, and a lot of patience, but it yielded an extraordinary result: Italy’s score leaped from 300 to 450, even with a conservative interpretation. The EPSI people thanked profusely the civic hackers in #SOD13 and updated its official site with our data. If, for once, Italy is proudly at the top end of a tech chart (in fourth position, after France, the Netherlands and the UK) we Italians owe it to them. In the same logic, SOD’s volunteers are manually populating the database supporting Twitantonio, an app that lets citizens find candidates to the upcoming elections: this work does not require more expertise than looking for someone on Twitter, but if it does not get done the app is useless. The monithon. This simple, elegant idea was proposed by the Opencoesione crowd. Opencoesione is a government project, and easily the largest-scale open data project ever deployed in Italy. The people in charge of it hang out in SOD since inception, well before Opencoesione was dreamed up, and I suspect that they got the idea from the mailing list. Monithon works like this: you query the Opencoesione database and find which projects near you your taxpayer euro went into. Then you go there, ring the bell and ask to see how it’s doing. 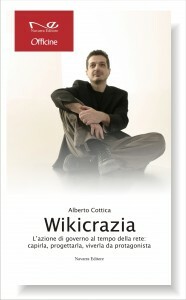 I did not take part in this, but the report (Italian) is great. A bunch of Ministry wonks roaming the renovated schools of Bologna, on a Saturday, with citizens in tow? That’s a sterling silver punk attitude to monitoring in my book! The documentathon. Developers – especially in open source communities, where many contribute on their spare time and are unpaid – don’t like to write documentation for the code they write. Often they are spread thin across a project, and they simply don’t have the time for it. Result: tons of undocumented code, very difficult to make sense of, improve and even use. Even very rookie programmers with minimal can be very useful to a development project simply by adding comments to code written by others (“here we simulate clicking on the top right link”). If you want to see an example, check out this scraper, written originally by Vincenzo and modified and commented by me. The iron pact with the ladies. The hacker community has a problem, and that’s that women tend to stay away from it – so it loses half of its potential! After reading a sombering post by Asher Wolf, I asked the community for help in making SOD more attractive to women. That led to a fruitful collaboration with the Bologna chapter of Girl Geek Dinner on the whole three-day gathering. Also thanks to them and their Spaghetti Open Data Gender Survey, rolled out as a track of our hackathon, the female presence at the gathering was numerically strong and high quality on all fronts, writing code included. I intend to keep trying to do more to build female-friendly environments. All in all, #SOD13 was definitely a step in the direction of “everybody is a civic hacker” – and that, as far as I’m concerned, is the right direction. We’ll see how it pans out. This entry was posted in Open government, social innovation and tagged #SOD13, Bologna, EPSI scorecard, Girl Geek Dinner, open data, Opencoesione on 28 January 2013 by Alberto.